Jack Marchbanks is the “big brother” in the Enteje writing collective. Born near Muscle Shoals, Alabama and raised in Dayton during the boom of the southwestern Ohio funk explosion of the 1970s, he was known as the “smart one” or “the egghead” by his high school classmates who formed Lakeside and by hisUniversity of Dayton Kappa frat brother, Clarence “Chet” Willis, guitarist for the Ohio Players. After gaining access to the Los Angeles music scene through his friends in Lakeside and Whispers’ tunesmith Dana Myers, Marchbanks briefly worked as a songwriter for Solar Records in the early 1980s. By the early 1990s, he found his calling as a historian and “keeper of the flame” for African American popular culture and music. He founded the African American Musical Heritage Group, an Ohio-based non-profit organization dedicated to educating the world and celebrating the underrecognized influence of black creativity on popular culture. 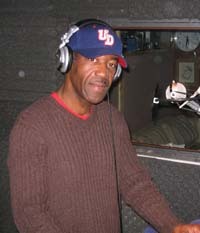 Marchbanks has produced several blues and jazz concerts. He has staged successful shows featuringA?Rock and Roll Hall of Fame legends, B.B. King and Buddy Guy, as well as other concerts headlining the late Albert King and KokoTaylor. He has written, produced and acted in “Jazzy Broadway,” an original musical revue chronicling African American’s contributions to the evolution of the Broadway musical. He has ten years of experience and accomplishments in writing and producing works for National Public Radio, particularly its Ohio affiliate stations. 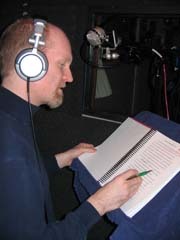 Among his notable works are award winning scripts for “Kids Sundae,” a weekly live theatre children’s radio hour that aired on on WCBE 90.5-FM( Columbus) from 1994-1996. He has also penned and had broadcast nationally his original commentaries on Morning Edition with Bob Edwards (2000)and on the Tavis Smiley Show (2002). Marchbanks has been such a consistent champion of Ohio’s African American musical greats that he was given a special honor by the O’Jays management team. They invited him to New York City and granted him an exclusive interview with the Canton, Ohio – born group prior to their 2005 induction into the Rock and Roll Hall of Fame. SIDney Howard is by default the little brother in the Enteje writing collective and with what we suspect of Big Brother, perhaps it is a great placement. Raised one hundred or so miles out of Memphis, Tennessee in the Mississippi Delta, his native musical influences would be Blues and Memphis Soul. But SIDney Howard’s awakening into music as a musician was more widely varied and cosmopolitan. He grew up in Mississippi on the campus Mississippi Valley State University–a pioneering Black college that his parents helped pioneer. In his former life, SIDz father (Dr. CW Howard) a former associate VP of MVSU was a big band Jazz reed man. SIDz mother (Dr. Zelma Howard) was the World Literature professor. As such the appreciation of both music and were developed from the beginning. In college, SID played keys for the Chi-lites and opened for Rufus featuring Chaka Chan. 1980, SIDney Howard graduated from MVSU’s Jazz and Commercial Music program and moved to Detroit to join Thang, Inc. Records George Clinton’s short-lived CBS imprint label. 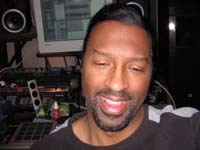 The old Motown base put him in contact as a composer/producer/keyboardist with not only the P-Funkmaster himself, but with Stevie Wonder’s golden ages coloaborator Sylvia Moy (My Cherie Amour, Sign Sealed, Delivered, etc. ), Barrett Strong, Stax’s and United Sound Systems’ Don Davis, The Dells, Johnny Bristol–whom SID had the priviledge of co-producing before his sudden passing in 2004. SIDney Howard started his writing career with his graphic novel The Amazing Adventures of Power Puppy illustrated by the author himself…graphic art having been his earliest gift manifested. That was followed by two volumes of short stories [Cranial Crumbs & Residue and Brainflush Protocol], and a current novel just ready for release. CCR and BP are currently being produced by the author for Enteje as audio books, featuring the exceptionally talented Tiren Jhames. The former (Cranial Crumbs…) was the inspiration for “Please Don’t Harmonica”. Songs from it “Eyerise” and “Carboverture” have been utlilized as background tracks for Enteje audio articles heard on ohiofunk.org. Check out other collaborative works by Enteje founders. mxtabs.